When comparing JSF to GWT and AngularJS in a previous post, I found that the (most often used) approach that the framework takes of abstracting HTML and CSS from the developer behind XML adds to the difficulty of debugging, because it creates an extra level of indirection. When first encountering JSF, I first tried to approach it from a Java, XML and documentation only. While I could do a part of the work that way, there where frequent situations where that approach was really not sufficient. This might sound surprising to developers that work mostly in Java/XML, but this web-centric approach to debugging JSF is the only way that I managed to tackle many requirements that needed some significant component customization, or to be able to fix certain bugs. Let’s start by understanding the inner workings of JSF, so that we can debug it better. The browser is assumed to be simply a rendering engine for the HTML generated at server side. Ajax is achieved by submitting parts of the page for server processing, and requesting a server to ‘repaint’ only portions of the screen, without navigating away from the page. The whole point of the lifecycle is to manage MVC 100% on the server side, using the browser as a rendering platform only. The initial idea was to decouple the rendering platform from the server-side UI component model, in order to allow to replace HTML with alternative markup languages by swapping the Render Response phase. So let’s go through each phase and see how to debug it if needed, starting in the browser. Let’s base ourselves in a simple example that uses an Ajax request. The new value of the input field is “Hello World”, send me a new value for the output field only, and don’t navigate away from this page. 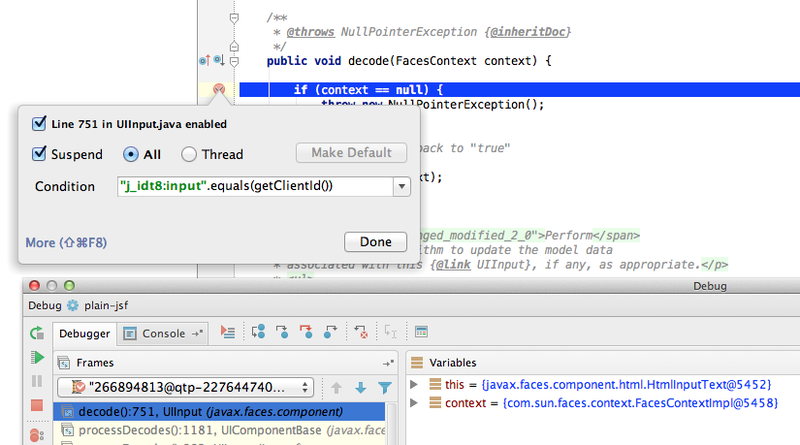 javax.faces.ViewState identifies the view from which the request was made. 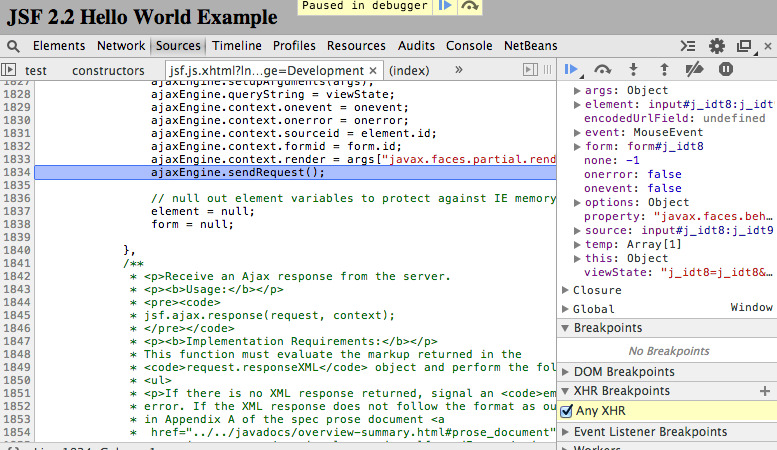 The request was triggered by a click as defined in javax.faces.partial.event. javax.faces.source: The identifier of the HTML element that originated this request, in this case the Id of the submit button. javax.faces.execute: The list of identifiers of the elements whose values are sent to the server for processing, in this case the input text field. javax.faces.render: The list of identifiers of the sections of the page that are to be ‘repainted’, in this case the output field only. But what happens when the request hits the server ? javax.faces.ViewState and identify to which view it refers. It will then build or restore a Java representation of the view, that is somehow similar to the document definition in the browser side. The view will be attached to the request and used throughout. There is usually little need to debug this phase during application development. 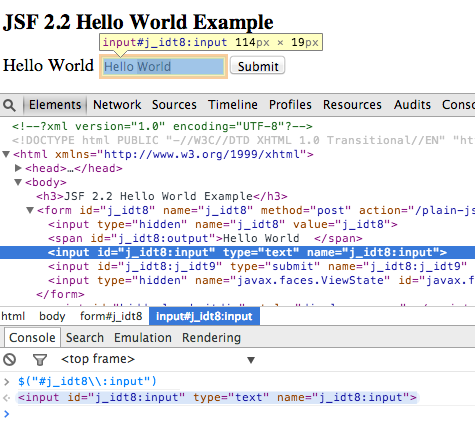 The JSF Controller will then apply to the view widgets the new values received via the request. The values might be invalid at this point. Each JSF component gets a call to it’s decode method in this phase. This method will retrieve the submitted value for the widget in question from the HTTP request and store it on the widget itself. Notice the conditional breakpoint using the HTML clientId of the field we want. This would allow to quickly debug only the decoding of the component we want, even in a large page with many other similar widgets. Next after decoding is the validation phase. In this phase, validations are applied and if the value is found to be in error (for example a date is invalid), then the request bypasses Invoke Application and goes directly to Render Response phase. processValidators, or in the validators themselves if you happen to know which ones or if they are custom. In this phase, we know all the submitted values where correct. JSF can now update the view model by applying the new values received in the requests to the plain Java objects in the view model. processUpdates method of the component in question, eventually using a similar conditional breakpoint to break only on the component needed. This is the simplest phase to debug. The application now has an updated view model, and some logic can be applied on it. This is where the action listeners defined in the XML view definition (the ‘action’ properties and the listener tags) are executed. encodeChildren and encodeEnd methods of the component in question. The components will either render themselves or delegate rendering to aRenderer class. Using the Id of the update, the client side JSF callback will search for a component with that Id, delete it from the document and replace it with the new updated version. In this case, “Hello World” will show up on the label next to the Input text field! To solve this, download the source code of the library and do a non minified build of the jar. There are usually instructions for this, otherwise check the project poms. This will install in your Maven repository a jar with non minified sources for debugging. The ui:debug tag allows to view a lot of debugging information using a keyboard shortcut, see here for further details. JSF is very popular in the enterprise Java world, and it handles a lot of problems well, specially if the UI designers take into account the possibilities of the widget library being used. We can wonder that if developers have to know a fair amount about web technologies in order to be able to debug JSF effectively, then it would be simpler to build enterprise front ends (just the client part) using those technologies directly instead. Did you find one of the GWT-based frameworks (plain GWT, Vaadin, Errai), or the Play Framework to be easier to use and of better productivity?